Best band ever! They were very personable and the dance floor was packed all evening. Will definitely have them back!! Backtalk! You guys were amazing! Thank you so much for keeping the party hopping! Our wedding would not have been the same without you. The dance floor was always packed and everyone has been telling us for the last week how much fun they had! Thank you also for learning our song, it was so special to have a live performance! Thank you so much for sharing the wonderful talents of The Backtalk Band at Kathy's birthday party at the Elmira Country Club on May 6th. Your music created a festive environment for our celebration. So many comments were shared by our friends of how they loved the music. The Backtalk Band was the icing on Kathy's cake. We will recommend you to anyone looking for a great band for any occasion. I wanted to thank you again for playing again this year at the BTI Holiday Party! You guys are always a highlight of the night and we all had so much fun dancing the night away to your music (I know I sure did!). Thanks again for making it a successful party. Wishing you a very happy and safe holiday and new year! On behalf of the staff event planning committee at The Boyce Thompson Institute, would like to thank The Backtalk Band for another fantastic performance at our annual holiday party. As always, they filled our evening with great music. We have been booking The Backtalk Band for our organization’s annual holiday party for over 7 years and are extremely pleased every year. 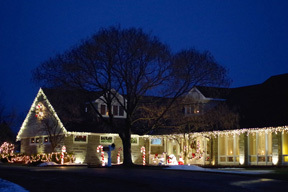 Over the years, we have received countless compliments from attendees of all ages. Jim Lawrence is accommodating, kind, and easy to work with. All contact with The Backtalk Band is always met with a prompt and courteous response. The Backtalk Band is elegant, entertaining, well-dressed, and extremely professional. They have an extensive repertoire and perfectly accommodate our diverse crowd, setting a festive holiday mood with some wonderful jazz melodies in the early evening then transitioning into classic rock favorites to fill the dance floor as the night unfolds. They have our highest recommendation. Thanks Backtalk Band! First of all, I just have to say THANK YOU - THANK YOU - THANK YOU!!! You guys did a TREMENDOUS job and I'm still hearing compliments almost every single day about how much everyone really enjoyed you guys! I KNEW they would love you guys - and I'm still shocked that none of them had ever heard you guys play before!! Just, thank you so much for helping pull off a great event!! Again, thank you so much for an incredible job!!! You guys are the BEST!!! Joan and I would like to compliment the ‘Backtalk Band’ for providing a wonderful night of entertainment for the celebration of our wedding. Our guests danced all night to the music you provided and many complimented the fact that the music was perfect for dancing, but not too loud at the tables to provide people to talk. Your music selection was perfect for our guest’s liking and you did an excellent job with our song request by Neil Young. Your professional style and ability made our celebration special. I highly recommend the ‘Backtalk Band’ for any occasion. Thank you so much for rocking out at our wedding, learning our requested songs and making it a fantastic evening for everyone. The dancing was definitely a highlight and we had a blast – we could've gone all night! Bob, thanks also for your beautiful music during the cocktail hour. It was a truly memorable evening and we loved the music. Enclosed is a token of our appreciation. We have received so many compliments from friends and family about all of you and just wanted to share it with everyone else. Frank and I certainly enjoyed every minute listening to all of you and you made us feel so comfortable never rushed and a great job as MC. We felt so bad for each one of you because of the heat but all of you were such professionals never complaining once. We will definitely check in on your website to see where you will be playing we will never lose touch. You all are extraordinary musicians and our memories of that day will never be forgotten. Thank you so much Jim and extend our very best wishes to each one of the band members on what a job well done. It will be a day we shall always treasure the rest of our lives. We hired the Backtalk Band for our wedding in Skaneateles in the fall of 2012, and they were absolutely fantastic. They capped the whole day so well, and they truly made then night just perfect. Jim was an excellent MC -- he has a great voice, nice personality, and didn't talk too much (like a lot of other DJs or MCs do) but created a very warm, fun atmosphere. They band sounded great and the dance floor always had lots of people on it. They play older music, but the good thing is that older people feel more comfortable dancing to it and the younger people will dance to everything, and young or old, you already know the songs. Their guitarist Bob Keefe also played dinner music. At one point one of our guests turned to us and we realized - wait, this isn't pre-recorded music? They also learned several new songs for our first dance, father/daughter dance, and were very accommodating--even allowing the groom to sing a song to the bride :) . After how fantastic they were at our Reception, we were very glad we chose them over all the DJs and bands we looked at and spoke with. 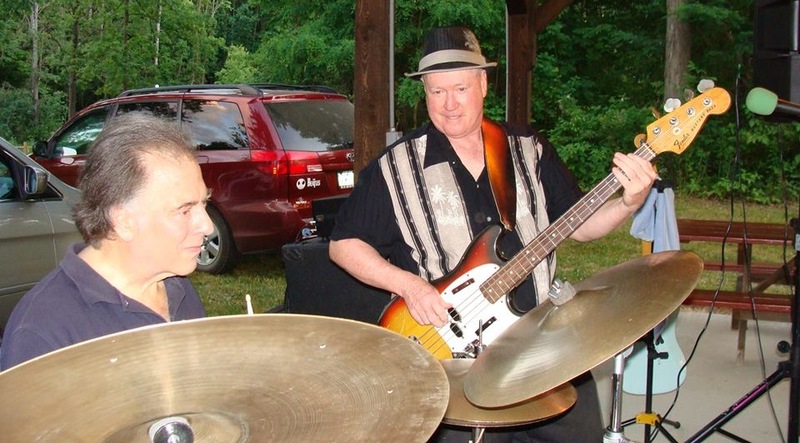 The Backtalk Band recently played at our wedding reception in Skaneateles and we had an absolutely amazing time. You were all a real pleasure to work with -from the minute I contacted you to the day of the event everything went very smoothly. During the reception, there was a great mix of songs from soft jazz through the dinner hour to fun lively dancing music when it was time to party. We especially loved your version of "Crazy Love" for us to enjoy for our first dance. Nothing but compliments from our guests throughout the night on how great the music was. Thanks again for a great evening! We thank you for your desire to tailor the music to our taste and style, adding helpful information so that everything would go smoothly. Truly a pleasure communicating with you! Matt and Liz loved your music and energy! Both of them kept thanking us for such a wonderful reception/music. A band is one thing that they desired and they were truly pleased! The guests loved you! We got so many comments about how wonderful your music and energy was. Young to old could not resist getting out there and dancing in some fashion. Our friend with a bad back was out there - definitely didn't expect that. I just had dinner last night with Matt's family; they had friends and family calling them to tell them what a great time they had. Many friends and family from both sides said that they have never had that much fun at a wedding - compliments to you! We truly appreciated you from start to finish and will recommend you highly to all! A big hug and sincere thank you for the part you played in making my wedding the absolute best day of my life. Never have I had so much fun, and the amazing job the band did really made the night! Guests were telling me what a wonderful job you were doing all night long. Your tunes appealed to all ages, from the youngest flower girl who came home and told her Mom that when she was dancing she had many "fans", to my parents' generation, who loved to hear the songs from their youth. Your songs had my Uncle cutting up the dance floor, using up the hip he was to have replaced the next week! And the terrific rendition of "Only You" made for a wonderful and emotional Father-Daughter Dance I will always remember. Finally, thank you for playing a perfect version of "Stand By Me" (and for allaying my concerns about timing the morning of the wedding!) and for allowing us to show off the dance lessons we'd been taking. As I said before, your poise and warmth made the evening actually relaxing for me - avoiding the rushed feelings other brides get from DJs / Bands keeping a schedule. A million thanks yous and a promise to come see you perform at other venues! Thank you so much for playing at the Radiology Associates post-holiday party last night! The music was awesome! You are all so talented and professional. You played a great variety of music. Thanks for making our event so special! It was a real joy having Backtalk as our wedding band and we can't thank you enough for making our party fun and special!! As to last weekend, you're very kind to write but it seems like I should be the one sending the thanks. You and your colleagues did an outstanding job at the Ball. When I was working with the Club staff on the arrangements I mentioned that I very much wanted the evening to bring a bit of magic into the lives of those who attended. From the feedback I've received, we clearly were able to do that...and in no small measure due to Backtalk's wonderful performance. Just as I'd hoped, you provided an array of music to beautifully complement the stages of the evening and did a great job of ever so delicately enticing the various ages out onto the dance floor. It was really neat to see true professionals at work. I had a great time and I know I speak for the rest of the attendees in expressing both our thanks your efforts and our admiration for your skill. Well done! Lucy and I would like to thank you for making our wedding reception one helluva party in the Statler at Cornell. As we co-ordinated everything from Japan, you made organizing the event so much easier and a lot of fun. From Bob's solo performance through the cocktails and the entire bands performance at the reception, your professionalism was reflected thorough your fantastic beats and the crowded dance-floor. I would strongly recommend other couples to sign this band early. 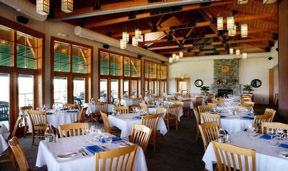 They are the best in the area and will make for a memorable event for all to remember. Half of our guests were between the age of 20 and 30 and they never left the dance floor...in addition to the older folk. You did a great job of playing songs that 'fit the moment' and kept people dancing. You can't beat some of the classics that EVERYONE. regardless of age, knows by heart and want to dance to. Jim Lawrence was also our Master of Ceremony and did a great job when it came to introductions of the bridal party and speeches.All in all they really made our reception one to remember and I highly recommend you book them early. We did 2 years in advance as they are very popular and do a fantastic job. You guys were great...many thanks!! You guys were great. I haven't danced that much in years. We've got to figure out how we get you on the road so we can do it again in Columbia County or NYC. As usual everyone LOVED the music last night. Thanks to all of the members of Backtalk and a special thanks to you for working on your night of celebration. Congratulations and thanks for everything. 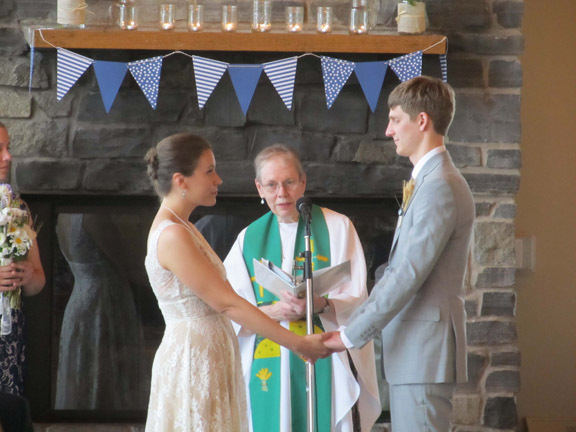 It's hard to believe that it was already over three years ago that we tied the knot at La Tourelle Inn in our beloved Ithaca, NY. In the spirit of "better late than never", we wanted to finally take this opportunity to thank you and the Backtalk Band for helping to make June 24, 2005 the happiest day of our lives. We will never forget how great the music was - the dance floor was always packed! And you guys played all the songs we requested and also did a great job as M.C. We selected you as our reception musicians because we saw how well you appeal to multiple generations - everyone from grandparents to grandkids had a blast. Best of all, we appreciated your enthusiasm and passion for facilitating an unforgettable celebration through your music. Please accept the enclosed photos as a token of our thanks, and feel free to display the photos, and/or this letter as a testimonial for your business. Again, thank you so much for being such an important part of our special day! Thank you for everything. People had a great time and there were many compliments about the band and the music. Kristen and I wanted to thank you for making our wedding such a memorable event for us and our guests. We couldnít have been happier with your performance. Everyone had a blast, and we continue to hear from others how great the music was! Jim was a great MC, who kept the party moving and on schedule without being in the way. And I was impressed with the bandís talent level and musicianship. You guys also know how to read a crowd, because the dance floor was full the entire night. Also, the staff at the Alumni House were impressed, and made a point of telling us that you were the best band that they ever had. Thanks again, and please feel free to use us as a reference in the future. Jim - Backtalk is always a great group to bring out a happy, relaxed feeling in a crowd. You did it again! Thank you and your team - so very much! It's hard to believe a week has gone by since the event. My heartfelt thanks for making it such an incredible success. You guys sounded terrific and everyone had such a wonderful time. It was terrific seeing you, and Don and I think the world of you. least a few have the opportunity to hire you all for something. You made the party really sparkle. I truly appreciate your musicianship and the fun you brought to the occasion. Jeff and I would like to thank you profusely for your performance at our Oct. 7, 2007 wedding! We just received our wedding video a few weeks ago and were so excited to see your sets, both during the cocktail hour and during the reception. Our guests were up and dancing all night - and truly enjoying themselves - which is all that we could have ever hoped for! We had a great time and you guys far exceeded our expectations and wishes! In fact, one of our guests (getting married in CA) are using you guys as their "wedding music inspiration"! Thank you! We can't thank you enough for everything you did to make our wedding day so special. The music was perfect! Just wanted to thank you all for a wonderful performance at my wedding reception on 9/1. As somebody who appreciates music, I was so impressed. All my guests thought you were fabulous and wanted to know who you were. Thanks for making my event a huge success. You were the star of our dinner dance! The music of the '50s and '60s was just what classmates wanted along with the selection of more current music. The Backtalk Band made it possible to reconnect with our classmates through music and dance. "Book that band for our 50th!" was heard more than once. Thank you for your part in making memories! We just wanted to thank you, and the Backtalk Band, for providing wonderful musical entertainemnt at the June 5th Service Recognition event. The feedback that we received was overwhemingly positive - attendees thoroughly enjoyed your music. Again, thank you! I said, "These guys will play at my wedding." Well, as you can probably guess by the fact that we are writing this testimonial, that band was the Backtalk Band, they did play at our wedding, and it was absolutely terrific. We were worried before the reception that our friends and family might be a little reserved and that no one would dance. I even charged one of my groomsmen with the task of getting people up and dancing should it start to lag like a lot of receptions tend to do. To the credit of the Backtalk Band, he never had a chance to fulfill that task. The minute the band started playing, the dance floor was full. I had never in my life seen my parents dance, so that should tell you a little something about their performance. Without exception, we are thrilled with the way the night turned out. From beginning to end, it was exactly how we envisioned it. Backtalk Band has our deepest appreciation and our highest recommendations. Thank You for a great time! We all had a blast and me and my father could not have danced to livelier band. Everyone thought you all were fantastic! We want to thank you for your amazing performance at our wedding on Oct. 21. The whole night is a blur, but how much fun we and our friends had dancing is very clear. Of all the comments we've received from our guests, the top one is how great our band was. You played exactly the right mix of music for everyone at the the wedding. Thank you helping make our day so special - please share our thanks with the rest of the band. We can't thank you enough for the wonderful job you did at our wedding! The music was truly outstanding, from the cocktail hour jazz all the way to the end of the reception. The songs were perfect and we had everyone of all ages out on the dance floor! We had wanted a small, intimate wedding but also a joyful celebration, and the music just sparked the party. We were thrilled! We have received so many compliments from our family and friends who also loved the band! Mary Margaret at the Linklaen House was impressed with your professionalism, and we appreciate all the effort in coordinating setup and taking that off our shoulders too! Also, my parents couldn't have been happier with our band choice and would love to be a referral for the band, if ever needed. Again, many many thanks! The entertainment was perfect and we won't forget all the joy you brought to our wedding day. When you are preparing to throw a wedding for 250 family and friends, you want all the details ironed out well in advance, with as little fuss as possible, so that you can focus on your daughter and on the celebration. That's what you want. As a veteran of three daughters' weddings--the last, on December 3, 2005--I can tell you that often, "little fuss" is not what you get. Let's take bands and DJ's for example. Some think it's their party, not yours. They wear what they want, and play what they want, not what you have requested, or play poorly, or look disinterested or bored with the proceedings, or have breaks longer than their sets, or use equipment that takes constant, obvious fiddling to operate, or have a limited repertoire of what they can produce with any quality. Want to avoid all these hassles at your next event? 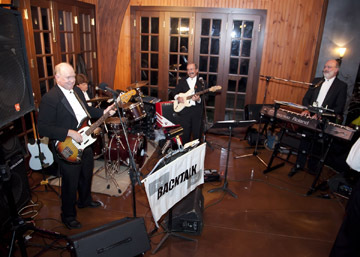 Hire Backtalk, the band that made our reception a smashing success! From the earliest contact, Backtalk was easy to deal with. Their website made it easy for our west coast daughter to hear samples of their work, while her east coast parents sat back and let her make musical choices for the event. Because the band's repertoire includes over 2000 songs, Kate had no trouble filling out her evening's playlist. The guys showed up in their best bib and tucker, and were set up and ready to go when we needed them. No muss, no fuss, no bother. This versatile group played soft jazz and big-band numbers during the dinner, "tuned to the room," so that guests were easily able to converse at their tables. I liked that they had anticipated that such an accompaniment to the dinner would add to our experience. With dinner over and 250 people ready to party, the band lit up the room with selections from the '60's on up, from Motown to Liverpool to Nashville to CBGB's, their sets a closely woven medley of one song seamlessly blending into another. Throughout the evening, the band were clearly enjoying doing their work! Their breaks were brief, with CD's supporting those who danced non-stop until the wee hours of the morning. The band handled numerous requests with grace and ease, as long as the tunes were consistent with what the bride had requested. My daughter and her new husband were delighted with their special evening, and with the Backtalk band who "stirred the drink." Margaret and I, as host and hostess for the party, could not have been happier with our choice of the Backtalk Band! And I was so glad that I had booked them almost a year to the day before the big event. They stay busy because they are the best at what they do. Want to guarantee that the musical note of your big day is a hit? Book Backtalk! I would like to take this opportunity to thank you and the members of "The Backtalk Band" for the wonderful performance at our wedding reception. You were above and beyond our expectations. Everyone, right down to the youngest enjoyed the music. We are still getting asked who the band was. 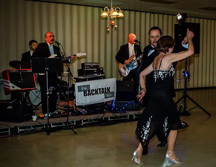 Rob and I would definitely recommend "The Backtalk Band" to anyone and if we ever need a band for any future occasions, we will surely call upon your group.Thanks again for a great performance and being a part of our special evening. What a great end to a very special evening for Rob and I.
Lisa and I wanted to thank you for an absolutely fabulous evening of dancing thanks to your outstanding performance at our wedding. Not only was your playing marvelously arranged and technically flawless - it was sincerely energetic and fun, which we and our friends and family could feel as we danced the night away. You were also impeccably dressed and professional throughout, providing introductions, microphones and background music when appropriate. Basically, you guys were perfect and we couldn't have asked for a better band. If you ever need a reference, please don't hesitate to ask, as we will provide a glowing recommendation. Again, thanks for a terrific evening! "If your gang likes to dance, then this is the Band for you! The Backtalk Band played for our daughter's wedding reception this summer and the dance music was non-stop. The dance floor was overflowing with everyone singing and dancing to one favorite after another. We were so impressed with The Backtalk Band and very thankful for the added dynamic they brought to the reception, making a night to remember even more special! Thank you to the boys in The Backtalk Band!" "We had a great time. . . I love your music. We got very good feedback from the crowd. I think the fact that the dance floor was full all night, right til goodnight, is evidence that everyone enjoyed themselves. I will not hesitate to pass your name on to others. I hope we have a chance to spend the evening together again." The Backtalk Band was a great success! People are still talking about how the music was a key element to the upbeat party and gemultlicht of the occasion. The band members are so very accomplished that I hope to hear the other formats someday. You worked well with the committee and with the guests. Just wanted to drop you a quick note to let you know that your band did a great job Friday evening. Everyone had a great time and you keep them all dancing all night. Many of the guests came up to me and wanted to know who the band was because they enjoyed the music. 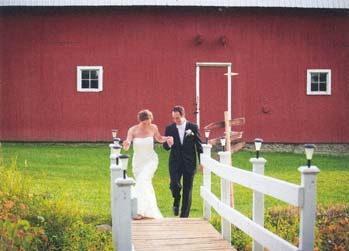 I'm delighted to tell you how much I enjoyed your music at the Wedding I attended on October 4, 2004 At the Red Newt. I was very very impressed. I must admit that I had been told what a great band you were. But coming from Chicago and being involved in the music scene here, I wasn't expecting much from "out in the country". Boy was I wrong! Your selections – and volume- were perfect for dinner. When the dancing started, you showed a remarkable versatility and built the mix, the volume and the pace to get the whole group up on their feet. I humbly admit my big city prejudices were unfounded. Thanks for a great evening. We received so many compliments from our guests and wedding party on your performance. It was wonderful, and we were so thrilled we selected Backtalk to perform at the cocktail hour and reception. Thank you and your team for making our night so memorable! 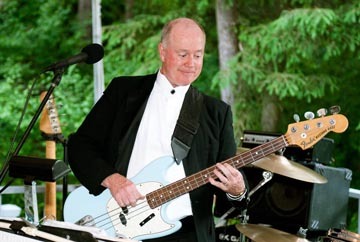 "Holly and I really appreciated your performance at our wedding, your band did an excellent job! We both got great feedback from our guests, and your participation really contributed to great evening for us with a nice touch of class. Thanks for your participation. Regards, Mark"
"Just wanted to send a note saying how much we enjoyed your band at Holly and Marks' wedding reception at Lakewatch in Ithaca Sept. 11. It was so much fun dancing to the music I love played with such enthusiasm and professionalism. Many comments on how great the band was and I enthusiastically agreed. Thanks for helping make the reception a happy and memorable experience. " "I received numerous very enthusiastic comments on the music and the band members: " The band was the best we've had in a long time..." The band played great music... and the musicians were friendly; they seemed to enjoy playing and interacting with the crowd..." "Can we get the same band again next year?" The band really made the party.... magic..." "What a successful evening... the people, the food, the band..."
My daughter Sarah was married this past January (2004) and we just had a great time at both the wedding and reception. But if you ask me what made the reception truly great, it was the Backtalk Band. They were the difference. A wedding reception should be fun, and they made it that. They have an incredible variety of music that they can play - jazz, blues, pop, rock & roll, etc., etc., etc. - and everything they do is more than excellent. We had many positive comments about the band for weeks afterwards (including one today, which is May 6) - everyone really enjoyed what Backtalk did. We debated on whether to save a few bucks and hire a DJ to play CD's. I am so glad that we had a live band. More than that, I am so glad that we had the Backtalk Band. If you are looking for a good local band - there are a lot of them out there, but if you want the best local band - then you'll have to get the guys from Backtalk. I promise you, you won't regret it. Thank you so much for making our reception an extra special and highly entertaining night to remember! We sincerely appreciate your flexibility and hard work to make our reception exactly what we'd hope it would be. It was a pleasure and a joy to have you perform and we're sure all our guests would agree. Thanks again for a great performance! Karl writes: "They were EXCELLENT! Very versatile in their music. Very professional looking (they wear tuxes) and sounding. Did an excellent job of introducing the wedding party etc. They take minimal breaks and had everyone at the reception dancing and having fun. Many of our guests later asked where I found such a good band. I would hire them again in a heartbeat. Did you listen to their music on their website? If not, then do so..it's a good representation of their sound and versatility. They played light jazz/pop music while we ate and later rock & roll, blues etc to dance to. Slow stuff and faster stuff." Thanks again for such a fabulous job - we have gotten SO many compliments on the band. One woman who's daughter is only 20 now said that she'd be in touch to get your name when her daughter gets married several years from now! We have gotten so many wonderful remarks about the reception and the quality of music you provided. I would certainly provide a reference and feel free to have future couples email me. You all are very talented, play an array of music for everyone, and present as very professional which added to the wedding. I did not want it to end. Thank you again for helping make the day a success. All of my classmates thoroughly enjoyed the Backtalk Band, as witnessed by the dancing that most everyone participated in! Several folks commented on how you were able to zero in on the musical style that our class seemed to want to hear. The music for the reception was absolutely on target as well. I, for one, was impressed with everyone's musicianship and personality. The entire evening was a success--assisted by the music! I just wanted to send you a quick note to thank you for such a great performance at our reception on September 29th. We just got our pictures back, and there is not one shot from the reception where someone isn't dancing. All anyone could talk about that night was how great the music was and how well you read the crowd. I always knew my family was a dancing bunch, but that night they even surprised me. Please feel free to use Roger and I as a reference--we can't sing your praises enough.All the best, and I hope I get to see you guys in action again! "Backtalk is the talk of the town after its performance at the Hangar Theater's annual gala. The band combines the playing of some of the best solo musicians in town with a great ensemble feel to rock the house! "This band can play anything!" was the shared sentiment from the exhausted but very happy dancers at the gala. Backtalk is a Hangar gala tradition, one that keeps getting better every year. From standards to 20-minute rock and roll medleys (not for the faint of heart!) Backtalk is a band to talk about!" Backtalk is the talk of the town after its performance at the Hangar Theater's annual gala. The band combines the playing of some of the best solo musicians in town with a great ensemble feel to rock the house! "This band can play anything!" was the shared sentiment from the exhausted but very happy dancers at the gala. Backtalk is a Hangar gala tradition, one that keeps getting better every year. From standards to 20-minute rock and roll medleys (not for the faint of heart!) Backtalk is a band to talk about!